Mixology Monday is a great idea, and it's something I'd been interested in participating in for a while. And now, with this blog, I don't really have any excuse not to participate. The topic this time around is brandy, which seems apropos for a winter month...and it's also a good spirit for my first MxMo, since (as I admitted) I don't really know a lot about it. When I think of brandy, I think of snifters, of course, and evenings spent in front of the fire, rolling the snifter between one's fingers as one contemplates the vapors. (Smoking jackets figure somewhat prominently in this reverie, too.) However, my New York City apartment is equipped with neither fireplace nor snifters (nor smoking jackets), and so I decided I'd have to strike out on my own. 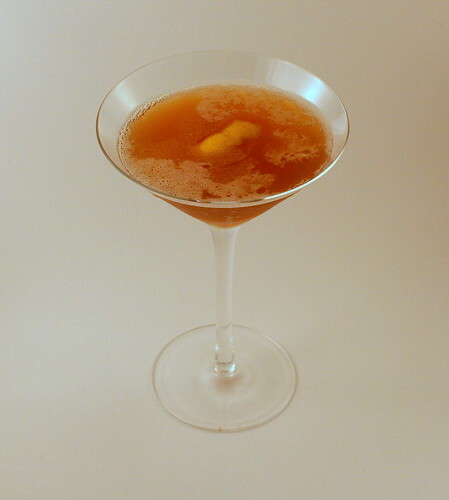 The quintessential brandy cocktail -- and one of my favorite cocktails ever -- would have to be the Sidecar, that heady, complex combination of Cognac, Cointreau, and lemon juice that manages to showcase each of its individual ingredients while simultaneously achieving greatness beyond the sum of its parts. I've had some truly amazing Sidecars -- I single out the ones at Angel's Share and Pegu Club in particular -- so I was anxious to try my own take on the cocktail. Shake with ice, strain into a chilled cocktail glass, and serve with a twist. Depending on things like the kinds of brandy (it'd be interesting to try this with a drier Cognac, such as Hennessy) and crème de pêche (the Vedrenne is pretty sweet and is only 18% alcohol, far less than Cointreau's 40%) you use, not to mention the acidity of the lemon juice, you may have to tinker with the proportions a bit. UPDATE: The MxMo roundup is now up at SLOSHED! Many thanks to Marleigh for organizing and hosting it all. And when I think of Brandy, I think of Packer games. Goes a long way toward keeping you warm at Lambeau. We're quite the brandy drinkers here in Wisconsin.